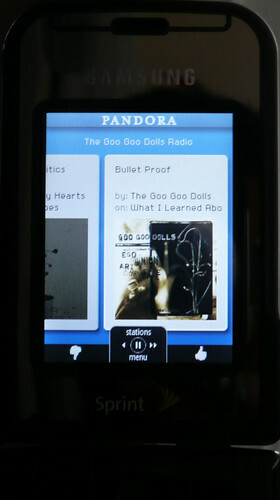 Pandora’s Internet radio service is now available on Sprint’s wireless network. Pandora allows you to quickly set up personalized radio stations based on artists and songs you like. The service then plays music it thinks you might like. I’ve been using Pandora’s free service on the Web for more than a year now. It’s a great way to discover new music. Pandora on the Go requires that you install an application on your phone. (Do this by going to pandora.com on your phone’s Web browser.) The application has a clean, simple interface. It even shows cover art for the song that is playing. You can scroll back and forth to give songs a “thumbs up” or “thumbs down”. Sound quality is decent, though not as good as on my iPod. In about thirty minutes of listening, I had two dropouts. You must be within Sprint’s high speed wireless coverage area to listen to music. The service is modestly priced – $3/month, with no advertising. The first 30 days are free. Pandora on the Go is a part of a spate of announcements from the company, including compatibility with the Sonos home audio system and a dedicated WiFi device. Pandora has been available for at least a year on the Squeezebox. What would be the effect of the proposed royalty rates on your company? It would be the end of Pandora. And that’s not hyperbole. The real issue is the per-song rate. It’s wildly counterproductive for everybody. It triples our cost, and that’s in a business that already does not have a big margin to it. Pandora on the Go faces an additional challenge: battery life. I listened to Pandora for about 30 minutes on my cell phone this morning while working out. Because the screen and wireless radio are on the whole time, this depletes the battery more than the talking on the phone for 30 minutes. The battery life on my Samsung A900 is pathetic enough as it is. I need to preserve it for actually talking to people. Still, it’s a compelling, low cost application. I can see popping into it for 5-10 minutes when I’m bored. This entry was posted in audio, consumer electronics, media, mp3, wireless, wireless data. Bookmark the permalink.